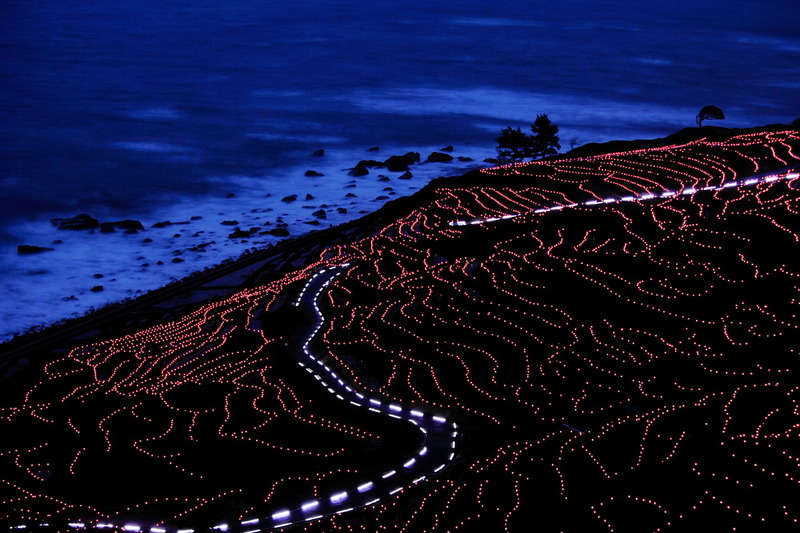 The senmaida rice terraces in Shiroyone, Wajima City will be illuminated from Saturday, October 18th, 2014 until Sunday, March 15th, 2015. Senmaida means a thousand rice paddies. It consists of over 1,000 pieces of paddy fields on a 40,000-square-meter slope along the coast. The paddies draw an amazing geometric pattern on the sharp hill. 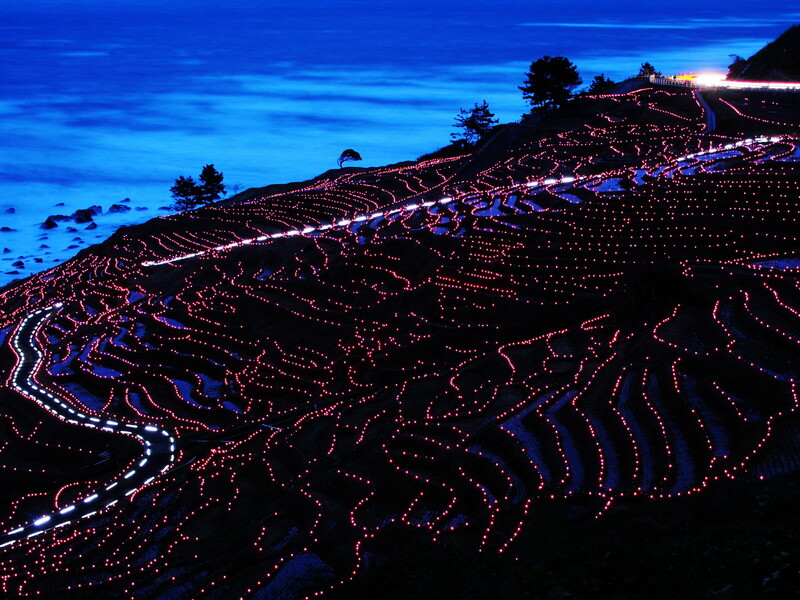 The rice terraces will be lit up during nighttime, creating a spectacular scenery. This popular annual illumination event is called Azenokirameki. This event is actually eco-friendly, as LED lights are solar-powered. It was recognized by Guinness World Records in 2012 as the largest display of solar-powered LED lights. 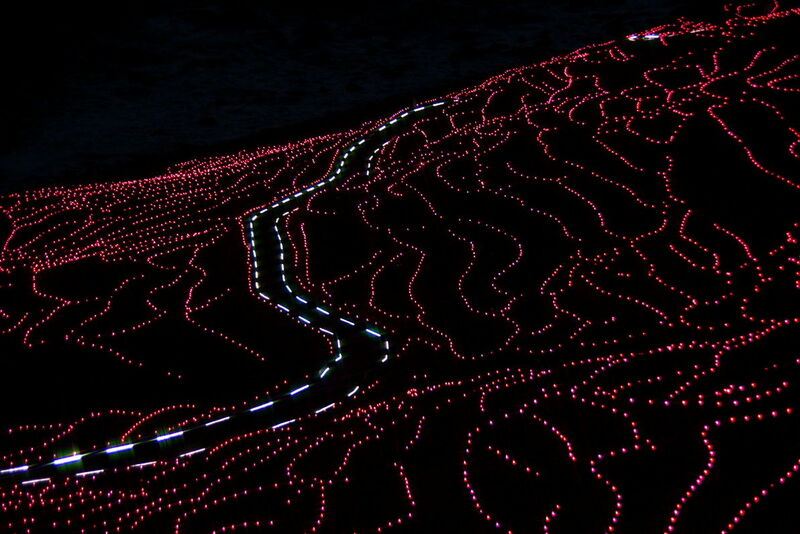 21,000 LEDs illuminate the rice terraces this year, and the lights color will change every 30 minutes. Many young couples visit the rice terraces since the beautiful illumination creates a very romantic atmosphere. As sun goes down, the rice terraces will be gradually lit up. Get there before sunset so you won’t miss the breathtaking view. Feel the sea breeze and enjoy this fantastic seasonal illumination that cannot be found in big cities.